Suarez says, “that Mary co-operated in our salvation in three ways; first, by having merited by a merit of congruity the Incarnation of the Word: secondly. 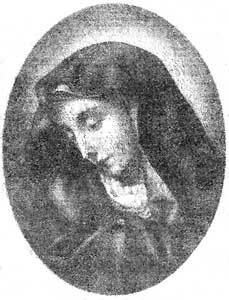 by having continually prayed for us whilst she was living in this world; thirdly, by having willingly sacrificed the life of her Son to God.” For this reason Our Lord has justly decreed, that as Mary co?operated in the salvation of man with so much love, and at the same time gave such glory to God, so all men through her intercession are to obtain their salvation. Jesus Christ says, that no one can find Him unless the eternal Father first draws him by the means of divine grace: “No one comes to Me unless My Father draws him.” Thus also does Jesus address His Mother, says Richard of St.. Lawrence: “No one comes to Me unless My Mother first of all draws him by her prayers.” Jesus was the fruit of Mary, as St. Elizabeth told her: “Blessed are thou amongst women, and blessed is the fruit of thy womb.” Whoever, therefore, desires the fruit must go to the tree; whoever desires Jesus must go to Mary, and whoever finds Mary will most certainly find Jesus. When St. Elizabeth saw that the most blessed Virgin had come to visit her in her own house. not knowing how, to thank her. and filled with humility, she exclaimed: “And whence is this to me, that the Mother of my Lord should visit me?” But how could this be? we may ask. Did not St. Elizabeth already know that not only Mary: but also Jesus, had entered her house? Why then does she say that she is unworthy to receive the Mother, and not rather, that she was unworthy to receive the Son, who had come to visit her? Ah, yes, it was that the saint knew full well that when Mary comes she brings Jesus, and therefore it was sufficient to thank the Mother without naming the Son. “She is like the merchant’s ship, she bringeth her bread from afar.” Mary was this fortunate ship that brought us Jesus Christ from heaven, who is the living bread that comes down from heaven to give us eternal life, as He Himself says: “I am the living bread which came down from heaven: if any man eat of this bread, he shall live forever.” And hence Richard of St. Lawrence says, “that in the sea of this world all will be lost who are not received into this ship; that is to say, all who are not protected by Mary;” and therefore he adds; “As often as we see ourselves in danger of perishing in the midst of the temptations and contending passions of this life, let us have recourse to Mary, and cry out quickly. O Lady, help us, save us, if thou wilt not see us perish.